The winners of the event, for the Men’s Division, on 3rd place was Gian Carlo Mercado with a total score of 136. On second place was Merwin Torres, with a score of 140 and for 1st place, winner was Raje Fama, with a total score of 150. For the Women’s Division, on 3rd place was Rachel Ann Martin, with a total score of 93. On 2nd place, it was Lynette Suler, with a score of 98. While, Joyce Reboton won for first place, with a score of 126. Joyce Reboton and Raje Fama will be sent to Kuala Lumpur Malaysia on May 6 for the Finals, to compete with other representatives from other countries. There were a total of 260 participants who competed in the said event, with 114 participants competing on the first day and 146 participants on the second day. 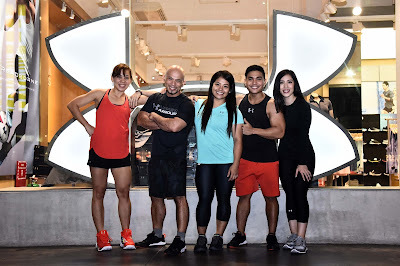 UA ‘Test of Will’ Philippine leg, offered athletes the chance to compete in a simple 4-minute circuit consisting of Burpees, One Arm Thruster, TRX Rows and Sandbag Throw. The side-events also included arm wrestling challenge and a fitness session with Elle Adda.